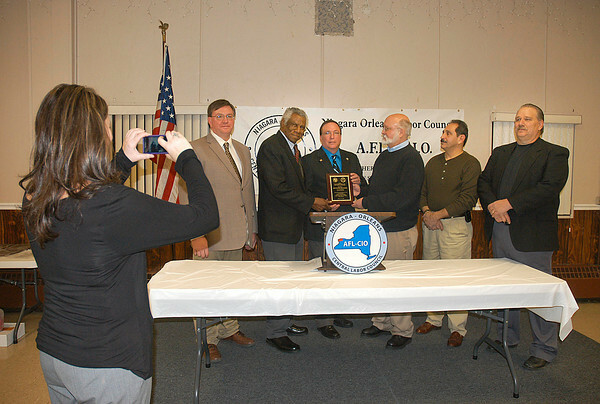 James Neiss/staff photographerLewiston, NY - Tammy Pudlewski with Teamsters local 264, left, snaps a group shot of the honoree’s at the AFL/CIO Niagara/Orleans Central Labor Council 2012 Annual Meeting at Lewiston Fire Hall #2. The Honoree’s from left are, Paul McCollum, business manager with Operating Engineers Local 463, Ronal Bassham, Veteran Committee with UAW Local 686, Master of Ceremoies Bill Jakobi, AFL/CIO, community services liason with CWA Local 1117, Kenneth Bjanek, L.E.A.P. coordinator with Teamsters Local 264, James Anthony, president of Local 9434 and Jim Briggs, president of the Niagara/Orleans Labor Council USW/District 4.